By observing a brown dwarf 20 light-years away using both radio and optical telescopes, a team led by Gregg Hallinan, assistant professor of astronomy at Caltech, has found another feature that makes these so-called failed stars more like supersized planets–they host powerful auroras near their magnetic poles. "We're finding that brown dwarfs are not like small stars in terms of their magnetic activity; they're like giant planets with hugely powerful auroras," says Hallinan. 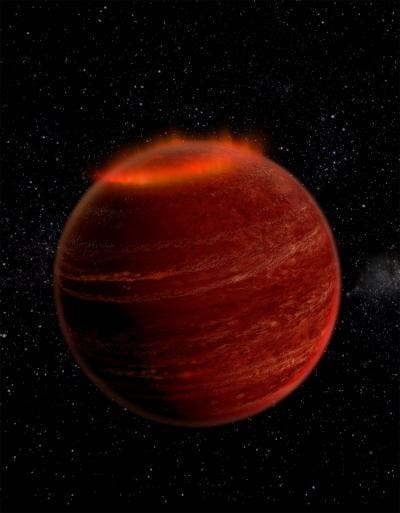 "If you were able to stand on the surface of the brown dwarf we observed–something you could never do because of its extremely hot temperatures and crushing surface gravity–you would sometimes be treated to a fantastic light show courtesy of auroras hundreds of thousands of times more powerful than any detected in our solar system." In the early 2000s, astronomers began finding that brown dwarfs emit radio waves. At first, everyone assumed that the brown dwarfs were creating the radio waves in basically the same way that stars do–through the action of an extremely hot atmosphere, or corona, heated by magnetic activity near the object's surface. But brown dwarfs do not generate large flares and charged-particle emissions in the way that our sun and other stars do, so the radio emissions were surprising. Next, the astronomers used the Hale Telescope to observe that the brown dwarf varied optically on the same period as the radio pulses. Focusing on one of the spectral lines associated with excited hydrogen–the h-alpha emission line–they found that the object's brightness varied periodically.